Fearlessly mothering is such a broad topic to blog about. I mean, there are so many different issues related to mothering – what exactly am I talking about? What are we afraid of? I know we all have horror stories about midnight puke fests and the Dirty Diaper Smelled Around the World, but is that what fearlessly mothering is all about? Not freaking out in the face of toddler excrement? As I prayed about my next topic, I felt like I needed to offer some sort of disclaimer. You see, in all honesty, this blog is a way I record the healing God is bringing in my own life concerning mothering and my identity in Him. When my firstborn daughter was born over seven years ago, I was overjoyed and excited, but I was also I unsure and insecure. I’d had a miscarriage previously, and in some ways I felt cheated of the sweet and simple innocence first-time mothers seemed to carry. I brought my own life experiences and pain into mothering, as we all do, but I didn’t really know how to sort through it all. God has brought a lot of healing into my life since then – especially lately. I feel this blog is a way of sharing what He’s done and continues to do. It’s so freeing that I feel to hold back this lovey goodness would prevent others from experiencing the same freedom. So I’m going to poke and prod and stumble and try to find a way with each rambling post to communicate encouragement, freedom, joy and love. And maybe some humor. But mostly the other stuff. That being said, I’m going for broke here and am getting weird, deep and personal in hopefully 500 words or less (yeah, right). So here goes. 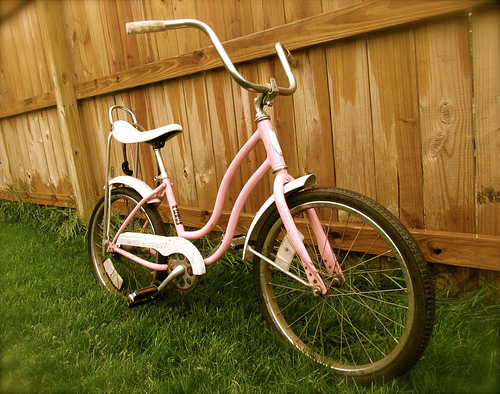 When I was 12 years old, I loved to ride my bike everywhere. On one journey, I decided to race through a huge rain puddle and ended up crashing my bike and taking a huge chunk out of my right knee. The wound was mortifying to my pre-pubescent self, and I was convinced I would never get married because the scar was so ugly and disgusting. (Overreaction much?) Needless to say, that experience literally left a mark on me. Other life experiences tend to leave scars, too, whether hugely noticeable or not. Not all of them are “I was abandoned by my parents and forced to sell drugs when I was 13” magnitude. There are the “people-you-tried-fitting-in-with-in high-school-but-didn’t” scars, or the “parents-you-could-never-please” scars. The “I’ve-never-felt-truly-beautiful” scars, and “I-trusted-someone-I-shouldn’t-have” scars. The “I-can-never-live-up-to-this-certain-standard” scars (hello, mothers everywhere!). We try to jump up after the fall and brush ourselves off, acting like nothing has happened, but a mark has been left. We make a mental reminder to not get into that situation again, because though the initial pain may fade, the scar remains. We try to dress up the scars. We put things on, and we pick things up to cover them. We hide them with makeup and beautiful clothes. We pick up things like degrees, accolades, or even ministries to keep ourselves busy and occupied. Before you know it, our arms are so full of stuff that we don’t have any room to hold on to any thing else! These beautiful mother-arms that were created to hold, nurture, and comfort are struggling to simply to maintain the heavy load. Our little ones want in, but that requires us to drop something. And honestly, we’ve been holding on to these things for so long, we’re afraid of what will happen if we truly let go. Because if we let go, we see the markings that didn’t fade. We study the lines. We relive hurt and anger. We become uncomfortable in our own skin. In this vulnerable moment, we realize we’ve allowed this scar, this Thing, to define us, so we cover them up once again and try to mother and nurture with scar tissue. But guess what, Dearest Mom? You are not your scars. Before you were ever a mother, you were a daughter. You are a daughter, and you are loved beyond measure –literally, you can’t measure it or humanly grasp its depth—by your Father. He doesn’t see scars. He sees beauty, purpose … redemption. Dearest Mom, you are not your scars. You are beautiful. You are treasured. You are loved. Before you had any scars, He took on fatal ones so that yours could heal. And because He did, you don’t have to cover your scars anymore. The truth about scars is that we all have them, but we don’t have to let them define us. You are not your scars. Remember that sweet, stinky-carpet-sticky-alabaster-box place of surrender we chatted about? Bring your scars there. Put down the things your hold, and uncover every nasty, gross, even pretentious scar you have. Feel arms of love embrace and heal them. God doesn’t need fancy words or a weekend seminar. As I walk through this personally, I am amazed at how eager God is to bring restoration. The moment surrender leaves my lips, He sweeps in with a huge Daddy God bear hug. God is so amazingly redemptive that He turns each scar from repulsive to redemptive; from tragedy to testimony. As you surrender, He will release the forlorn and restore you to Fearless.